The AQS24-B minehunter and console. Northrop Grumman and SeeByte are collaborating to incorporate AQS-24B mine hunting sensor data into the SeeTrack system to enhance its Autonomous Target Recognition capability. 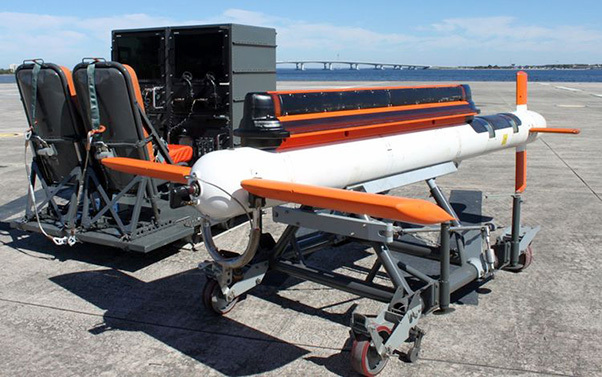 The AQS-24B scans the ocean floor at a speed of 18 knots, which is nearly twice as much as any other operational towed minehunting device in the world. It utilizes a high-resolution, side scan sonar for real time detection, localization, and classification of mines at high coverage rates and a laser line scanner to provide precision optical identification. The AQS series minehunter is used globally and has logged thousands of hours of operation. “The merging of the unmanned surface vessel-based AQS-24B with the SeeByte ATR will provide international navies with a better probability of detection and classification of bottom mines than is currently possible with an operator-only system,” said Alan Lytle, vice president, undersea systems, Northrop Grumman. Northrop Grumman and SeeByte began their collaboration over a year ago and will be ready to demonstrate an initial release of this new capability during the Australian Navy’s planned Autonomous Warrior 18 exercise in Jervis Bay, Sydney, New South Wales, Australia, in November. “This will be the first ATR in existence directly supporting the highest-speed synthetic aperture sonar in the world, and marks a true advancement in the state of the art for such capabilities,” said Bob Black, CEO of SeeByte. SeeByte provides clients in the military and oil and gas sectors with advanced software to enhance the capabilities of their underwater sensors, vehicles, and systems. SeeByte partners with leading hardware manufacturers to provide enhanced capabilities for its sensors and systems to provide cues to enhance the warfighter’s ability to find undersea explosives.